Brooke Gregory jumps for the ball during a match this season. Gregory posted a team-high 15 kills in in Butler’s loss to St. John’s on Sept. 22. Jimmy Lafakis/Collegian file photo. The Butler volleyball team split their annual trip to the New York City metropolitan area, sweeping Seton Hall University on Sept. 21 and losing to St. John’s University in five sets on Sept. 22. The Bulldogs now sit at 4-10 (1-1) on the season. They made a statement in South Orange, sweeping the Pirates 25-13, 26-24, 25-20. Senior middle blocker Bri Lilly notched 15 kills in the win. Butler out-blocked both of its opponents this weekend, holding a 9-3 advantage over Seton Hall. 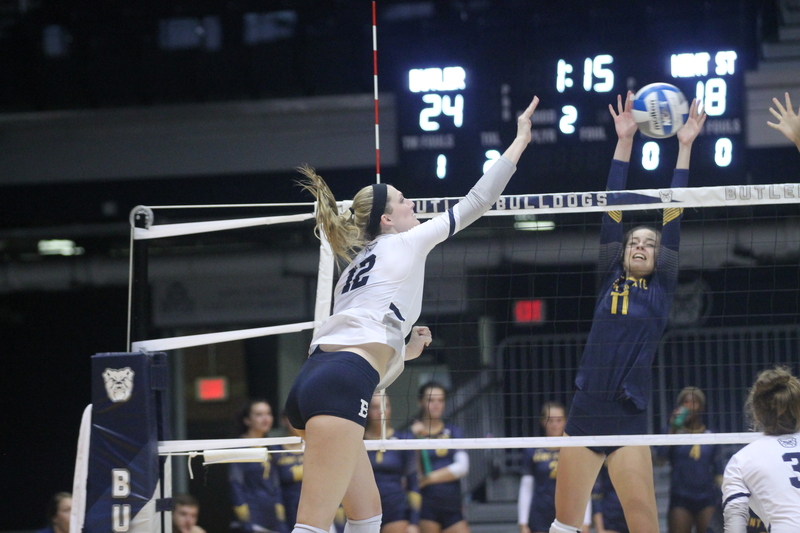 Butler lost a five-set thriller (25-22, 21-25, 25-21, 22-25, 15-11) to the Red Storm. Junior outside hitter Brooke Gregory posted a team-high 15 kills, while freshman libero Elizabeth LaBue added a team-high 19 digs. The Bulldogs out-blocked the Red Storm 23-7, and Lilly posted 12 kills, 12 blocks, six service aces and four digs. Butler returns to Hinkle Fieldhouse for their next two games. The Bulldogs will host Creighton University on Friday, Sept. 28, and Providence College on Saturday, Sept. 29. Both matches are set for 6 p.m.